Perfect Summer Vacation Lake Home! Pleasure Point is located on a point with a big water view on Lake Murray in Gilbert, SC. This executive house sleeps 10 comfortably, with a main home and a studio apartment over the garage it is perfect for a multi family vacation. 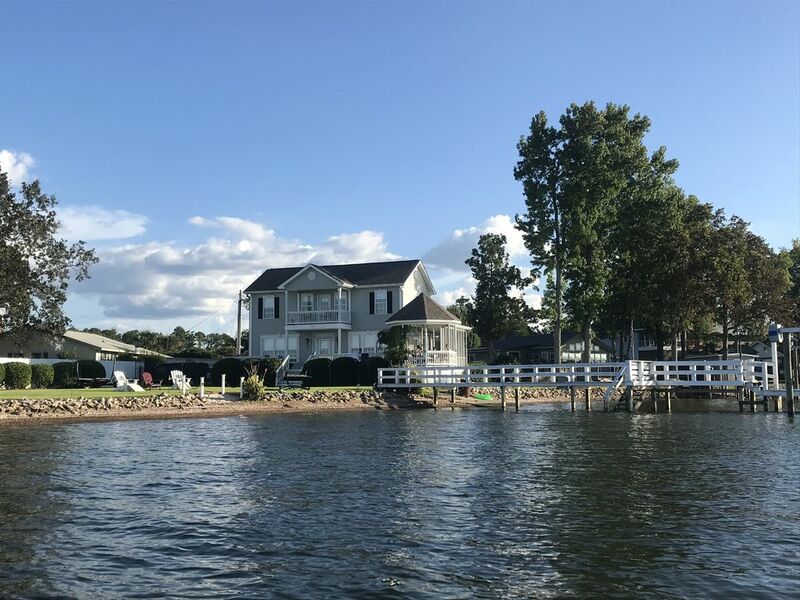 This home boasts a big water view with a wrap around porch that includes a wisteria draped Gazebo with a fire pit for evening Smore roasting and a screened in area with fans to escape the heat. There is also a sandy beach area for the kids to entertain themselves. The entire property's water starts shallow and gradually becomes deep which is perfect for small children to play with a parent. The home has a dock with year around water and excellent fishing for Striper. There is also a boat lift that could be adjusted upon arrangement for those seeking a long-term rental. The main home has 3 bedrooms and 2 and a half bathrooms. The Master Bedroom upstairs has a private balcony with amazing views, King Size Serta bed and full bathroom with marble flooring, stand up shower, a jacuzzi style tub, and a toilet with french Bidet. The second bedroom in the main home is also upstairs with a full size bunk bed. The downstairs bedroom in the main home is large with a Queen size bed (new Serta mattress). There is also an attached Studio Apartment above the garage with a full kitchen, a King size bed and twin bed, kitchen, living room, and a full bathroom. The home has hardwood floors and/or tile and granite countertops with an open floor concept, everything you are looking for in an executive setting, from the views of the lake, to the 3800 sq. ft. of usable living space, to the tranquility of the waters of Lake Murray. Book your vacation rental with us today!!! Our motto is this: 'If you're lucky enough to live at the lake, then you're lucky enough'! I was blessed enough to grow up playing in the tranquil waters of Lake Murray and always dreamed of one day owning a home on the lake. I passed this love of the lake onto my husband. This home is our dream home but since we were temporarily transferred to Florida, we are delighted to share it with you. If you've ever looked for lake property, then you know what a task it is to find both good water and a good home. The moment we found this property, we knew it was the one. Outside of a swimming pool (which we completely intend to add at some point in the future), it had everything on our lengthy checklist. View more about Tammy T.
This home is located on a true point with panaromic views of Lake Murray from every window! It has a dock and for long term rentals the boat lift could be retrofitted upon arrangement. Separate air conditioning for the upstairs and downstairs in the main home and for the studio apartment. Note: Must be left at 78 upon chck out. Separate heating for the upstairs and downstairs in the main home and for the studio apartment. Note: Must be left at 65 upon chechout. One set of linens will be provided for ach bed. Note: These items wil be folded on the bed and the beds will not be made upon arrival. When chcking out, please leave linens on beds. Washing machine located in the main home's third bedroom closet and in the garage for the studio apartment. Parking spaces for up to 6 cars. NOTE: Cannot park in the road or in front of the fence. Garage at the home but not used for parking in. Please leave all bagged trash in the garage upon check out for removal by the cleaning crew. A towel and wash cloth will be provided for 10 people. Living room located in both the main house and a living room in the studio apt. Dishwasher in the main home's kitchen. Full size fridge located in the main home's kitchen, another full sized fridg located in the garage and mini fridge in studio apartment. Operating stove in both the main home and the studio apartment. Operating oven in both the main home and the studio apartment. Operating microwave in both the main home and the studio apartment. Coffee maker in both the main home and the studio apartment. Toaster in both the main home and the studio apartment. The home will be supplied with the followinjg items: two rolls of toilet paper per bathroom (4 bathrooms), two dish tabs for the dishwasher, a small bottle of dish washing liquid and 4 trashbags. Dishes and utensils in both the main home and the studio apartment. Fully stocked kitchen in the main home and another fully stocked kitchen in the studio apartment attached to the home and over the garage. Both have mircrowavess, toasters, coffee pots, dishes, etc. TV's in the living room and all bedrooms in the main home and in the studio apartment. Surround sound througout the main home, including the master upstairs and the screened in porch outside. Note: No loud music after 11 p.m.
DVD players in all bedrooms except bedroom 2 upstairs and living rooms in the main home and in the studio apartment. Books available for your reading pleasure. Board games available for your use. Large balcony located off the master suite. Large porch on the home ovrlooking the point. Home features a sandy beach area perfect for building sand castles and has a swing and hammock for your use. At night, enjoy the breeze on the point by lighting a fire in the firepit. Beautiful view with both early morning and evening a picture perfect setting. Beautiful home, inside and out! We chose Lake Murray for our fourth annual family vacation. There were six adults, and five children aged six and under. The home was perfect! It was clean, well stocked, spacious, and comfortable. The outdoors worked out perfectly for the children. They could get in the water and play without being in over their heads. There is a sand box, a grass yard, and it is fenced in. All this is less than two hours from our home. The owners were the BEST VRBO owners from whom we have ever rented. And that is about 20 different places. They were responsive, attentive, and really cared that we enjoyed our stay. It was very hard to leave. We will return! I surprised my girlfriend with a trip to Lake Murray for her birthday. The house was absolutely beautiful and spacious enough for our family and friends. The views from the rooms were so amazing we didn't want to leave. The owner was extremely helpful, he called during our our stay and after our departure to ensure everything was to our liking. We will most definitely be back. Stunning View and Beautiful Home!!! Just as the owner's stated, you have Lake views from every window in the home. All the furniture was new and the hardwood floors were stunning. Homeowners checked on us to ensure our stay was above expectations and even provided some extra's such as firewood and starter logs. The yard and views were unbelievable as the sunsets were the most relaxing part of the day. We even caught a few fish!! There was plenty of yard furniture in the garage to bring into the back yard, as well as toys/floats for all the kids. We will certainly come back to enjoy the home again. Very beautiful house on Lake Murray. Great time with our family and extended family. House was very clean and comfortable. No problems at all! The daily and weekly rates include taxes, linens and cleaning fees. (except for the separate $500 security deposit, VRBO fees and applicable taxes).